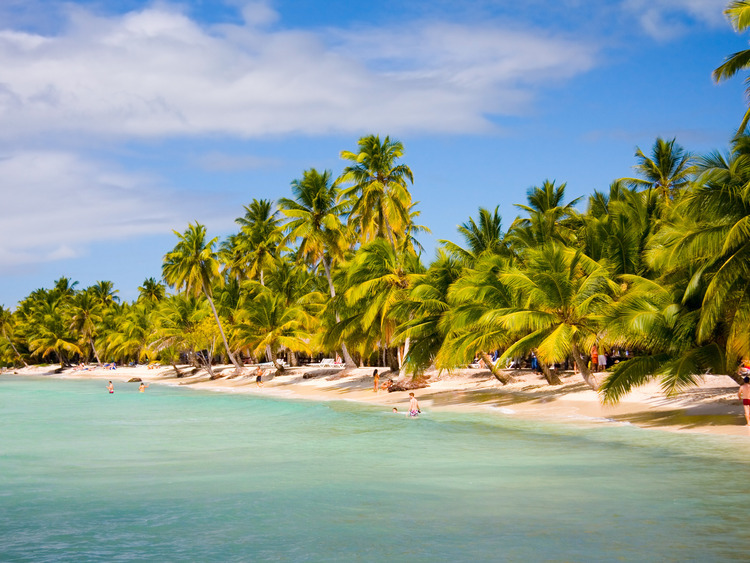 An exciting boat tour along the Dominican coast with panoramic views of the coastline and the crystal clear waters followed by lunch and a relaxing visit to the splendid Island of Saona. We leave from the port of La Romana by coach and head for Bayahibe, where we board a 9 metre twin-engine motorboat. During our panoramic tour along the coast we stop at the Caribbean beach of the Island of Saona, where we can indulge in various recreational activities such as: swimming in the crystal clear waters, sunbathing and relaxing in total abandon. When it is time for lunch we are treated to a Caribbean style buffet with refreshing drinks. After lunch, we have more time to relax and enjoy the splendid beach. We also stop for a peaceful swim at a charming natural pool that is less than one metre deep with particularly calm waters: ideal for regenerating energy reserves in preparation for the return journey. This excursion is not recommended for guests with back problems and pregnant women. The motorboats have open tops so we recommend waterproof clothing. The motorboat transfer to Saona Island takes approximately 1 hour and 30 minutes. Depending on the weather and the conditions of the sea, the swimming pool stop may be subject to change.